In the 1400s as today, Venice shimmered richly above kaleidoscopic reflections in its canals and lagoon. The city was astonishing to travelers; Petrarch called it mundus alter, “another world.” Venetians themselves were aware of their distinction and they made it the stuff of national myth. It was not simply the city’s opulence or unique island setting. During centuries of shifting politics and alignments, Venice remained a stable republic headed by an elected doge, or duke (a system that would last into the eighteenth century). The most populous city in Italy, Venice was also the most cosmopolitan and diverse, enriched by trade and cultural contacts with the East. And, while other cities in Renaissance Italy looked back to a classical tradition, Venice was an inheritor of the “Second Rome”—Byzantium. Legend had it that fishermen fleeing the Barbarian invasions had settled on islands in the Venetian lagoon only at the end of the Roman empire (although recent archaeological work shows some evidence of earlier habitation). In the sixth century the city was already under the political dominion of the Byzantine emperors. Its first patron saint, Theodore, was an Eastern one. After the relics of Saint Mark were stolen from Alexandria and transferred to Venice in the ninth century, they were housed in a new basilica modeled on the Church of the Holy Apostles in Constantinople. It glittered with gold-backed mosaics and, after the Fourth Crusade, the interior walls were faced with marble veneers removed from Hagia Sophia. On the high altar stood the Pala d’Oro, a rich assemblage of gold and enamels commissioned initially in the Byzantine capital. 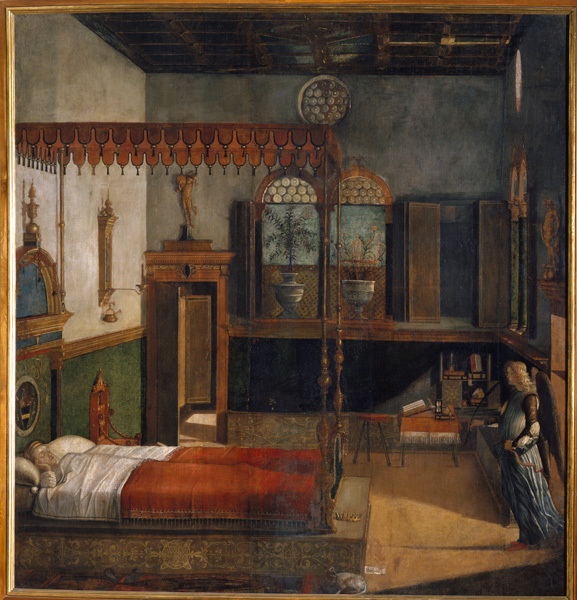 A taste for icon-like images of the Madonna and Child lingered in Venice, even after the innovations of the Renaissance had been fully absorbed. Paolo Veneziano was Venice’s most influential artist in the early fourteenth century and the earliest whose name we know. He painted the panels, now lost, that covered the Pala d’Oro, which was shown only on feast days. Paolo’s style is essentially Byzantine, with ethereal figures and flat gold backgrounds. 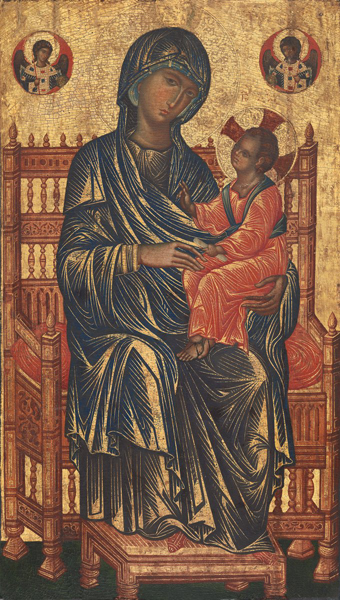 Compare his enthroned Madonna and Child with the one by an anonymous Byzantine artist illustrated earlier. In each, the face of the Virgin has an ascetic beauty, and the child the same adult-like posture. 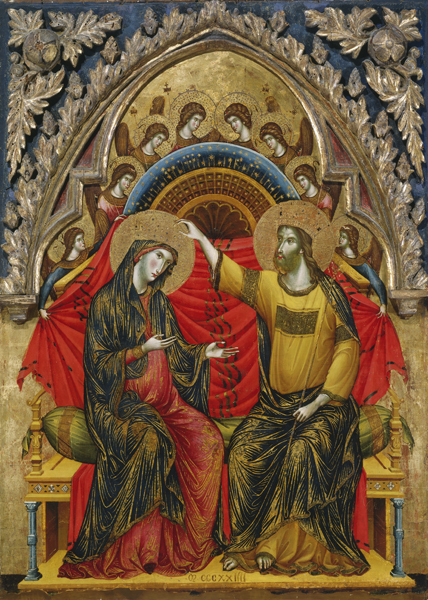 Paolo’s Coronation of the Virgin, however, treats a theme found only in the West; it is possibly the first depiction of this subject painted in Venice. Yet its strong colors and brittle figures seem almost abstract, a sense increased by the gold striations of the drapery: even without Byzantine models to follow, Paolo’s Coronation has a strong Byzantine character. Inventories surviving from the Renaissance indicate that some 90 percent of Venice’s artisan households owned at least one painting. Most were images of the Virgin and Child, and many were described as being alla greca—in the Byzantine style. 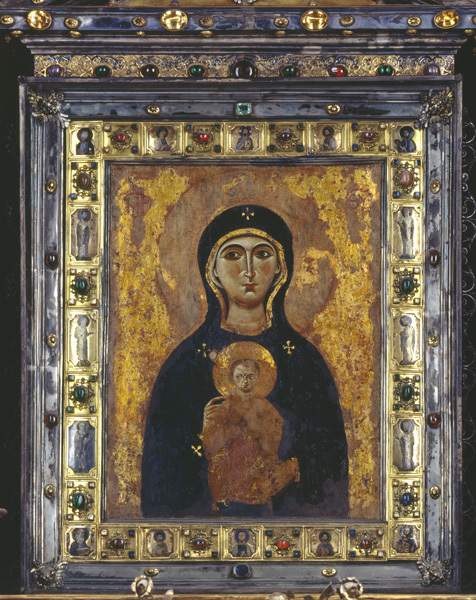 Hundreds of icons were imported to Venice from the Greek East, especially from Crete, which was Venetian territory until the seventeenth century. 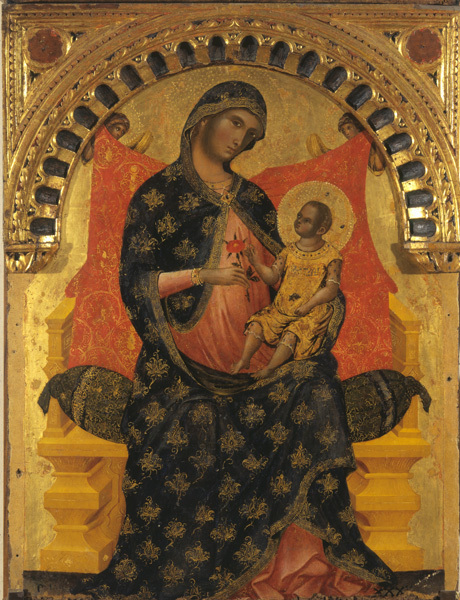 Demand also prompted local artists, called madonneri, to produce devotional panels of the Mother and Child. These mostly half-length Madonnas, generally workshop productions meant to be purchased out of stock, recalled and partook of the lineage of Saint Luke’s images. 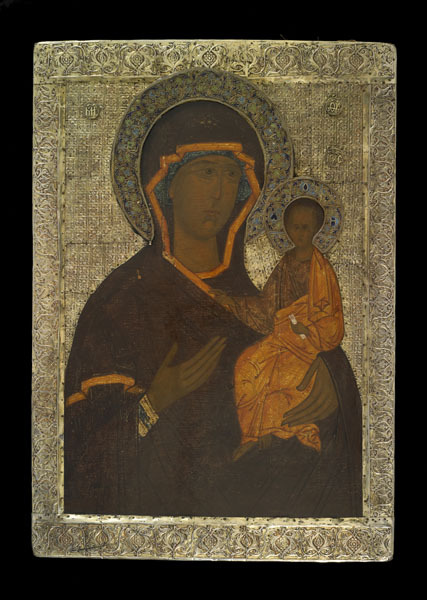 The half-length format employed in icons was also a convention of contemporary portraiture, and the devotional images of the Virgin and Child share the intimacy of portraits. In both icon and portrait, we see the figures up close, in a way that forces our concentration. Aside from a low parapet that often serves to support the child, no middle ground separates us from the figures. While the parapet removes the Virgin and Child to another, holy, realm it also contributes to the sensation that we stand face-to-face with them—not their painted images. A devotional image is portrait, presence, and apparition in one. The holy figure is meant to become manifest to the worshiper who meditates on the image, just as a portrait brings a person to life in the minds of loved ones or a vision appears in response to prayer. In a letter of 1468 to the doge, Cardinal Bessarion wrote: “As all peoples of almost the entire world gather in your city, so especially do the Greeks. Arriving by sea . . . they debark first at Venice . . . and there they seem to enter another Byzantium.”9 Bessarion was a Greek scholar who accompanied a failed Byzantine mission to reconcile the Eastern and Western churches and later made his home in the West. In 1468 he donated his extensive library to the Venetian senate. These texts became the core of an important collection of works by ancient authors that drew scholars from around Italy and prompted Aldus Manutius to open his Hellenic academy and press in Venice. rich color: As a center of trade with the East, Venetian artists had access to the finest and most exotic pigments. explorations of light: Light appears as an active element in Venetian art, from the glitter of mosaics to the light-suffused landscapes and holy figures that seem almost lit from within. conservatism: Conservative tastes were sustained by the continued religious authority of Byzantine art as well as a social and political structure that discouraged the “showiness” of novelty that was sought by princely patrons elsewhere.